Ay has been sorta-kinda looking forward to this weekend’s game play. The thoughts are to do a string of battlegrounds with his darling orphan child. Not too sure how well that will go. But I guess the kid should know that the world is at war more times than not. It’s a learning thing. This past week, Ay has been running around familar dungeons. 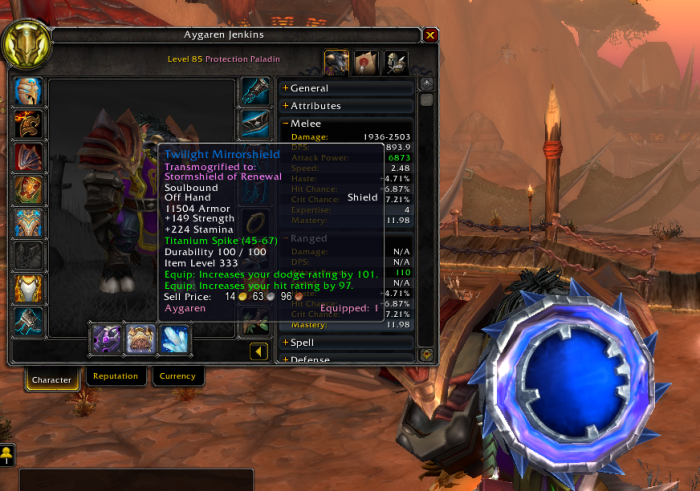 He already has the Classic and Outland Dungeonmaster achievements, along with about half of Northrend. For some odd reason though, he decided to back up a few steps and re-do some in heroic style and now has a healthy completion list going on. 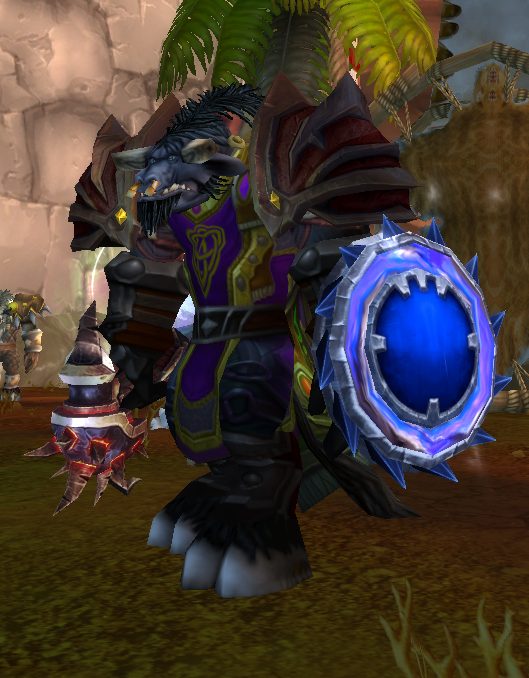 Along the way, he’s gathered up quite a selection of shields, many of which he now keeps for transmogrification use. Some, he can’t even remember where they came from! 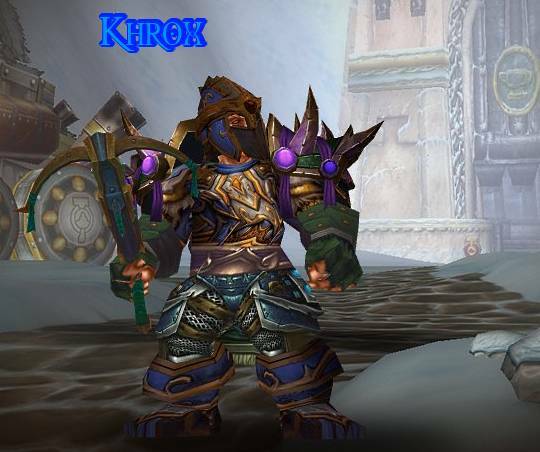 This one really caught his eye though, so it is the current mogging endeavor. The ring of colors actually swirl around! 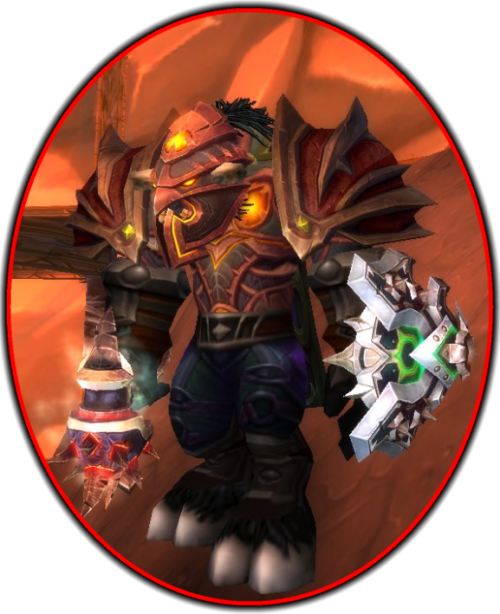 I hear that Ay is considering building a “look” around this shield. That should prove very interesting, and probably quite a project I’m sure. Of coarse, he just could’nt be satisfied with just a new shield look. Having a bunch of honor points burning a hole in his coin pouch, he headed off for some shopping. The result of that trip was a new mace. Quite deadly and right up his alley. Now, don’t they just go together well?